in: Hoaxes & Scams, It's Funny. Laugh! 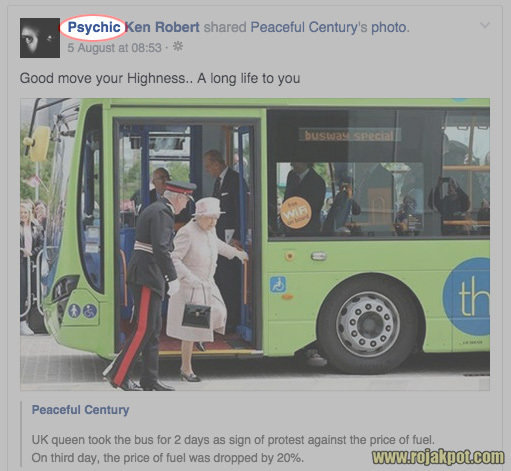 When we covered the Peaceful Century‘s hoax about Queen Elizabeth taking a bus to force fuel prices to drop by 20%, we noted how quickly it turned viral. This brought Peaceful Century (a blog) lots of new likes and plenty of shares. Our opinion on their lack of ethics aside, it showed just how gullible people are. Oil prices are set by a certain entity. Queen Elizabeth can influence oil prices. A queen sitting on a bus for two days can force oil prices down. Psychic Ken Robert professes to be “a Gifted Psychic Medium Clairvoyant with profound intuition“. He claims to have written four books (or as he calls them, “book’s” [sic]) and even has an online radio show on psychic readings and the paranormal. Ken Robert is no psychic. He lacked not only foresight but also hindsight! If you aren’t sufficiently convinced now that Psychic Ken Robert is no psychic, feel free to listen into his weekly radio show on psychic readings and the paranormal. Be sure to ask him for a winning number on the next lottery! LOL! Previous : DNA In Cow’s Milk Creates Hot-Tempered Children – UPDATED! The Tesco 100th Anniversary Scam Exposed!